Blockchain is generally associated with Bitcoin and other cryptocurrencies, but these are just the tip of the iceberg. This technology was originally conceived in 1991, when Stuart Haber and W. Scott Stornetta described their first work on a chain of cryptographically secured blocks, but only gained notoriety in 2008, when it became popular with the arrival of Bitcoin. It is currently gaining demand in other commercial applications and its annual growth is expected to reach 51% by 2022 in numerous markets, such as those of financial institutions and the Internet of Things (IoT), according to MarketWatch. 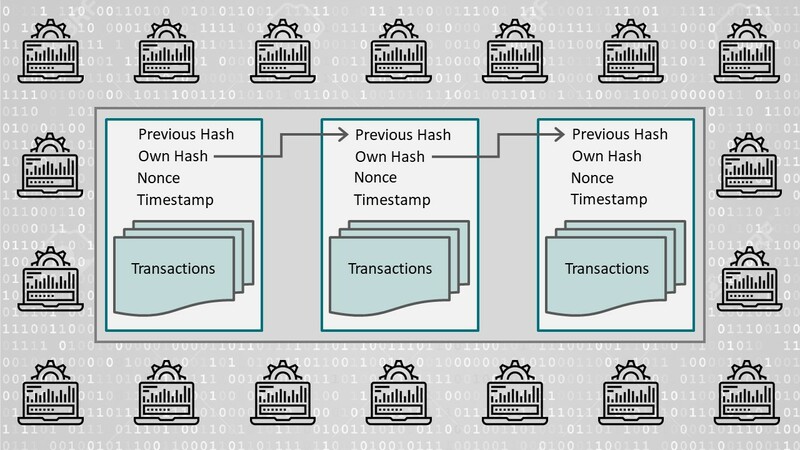 A blockchain is a unique, consensual record that is distributed over multiple network nodes. In the case of cryptocurrencies, think of it as the accounting ledger where each transaction is recorded. A blockchain transaction is complex and can be difficult to understand if you delve into the inner details of how it works, but the basic idea is simple to follow. A number of valid records or transactions. Information referring to that block. A link to the previous block and next block through the hash of each block—a unique code that can be thought of as the block’s fingerprint. Accordingly, each block has a specific and immovable place within the chain, since each block contains information from the hash of the previous block. The entire chain is stored in each network node that makes up the blockchain, so an exact copy of the chain is stored in all network participants. As new records are created, they are first verified and validated by the network nodes and then added to a new block that is linked to the chain. How is blockchain so secure? Being a distributed technology in which each network node stores an exact copy of the chain, the availability of the information is guaranteed at all times. So if an attacker wanted to cause a denial-of-service attack, they would have to annul all network nodes since it only takes one node to be operative for the information to be available. Besides that, since each record is consensual, and all nodes contain the same information, it is almost impossible to alter it, ensuring its integrity. If an attacker wanted to modify the information in a blockchain, they would have to modify the entire chain in at least 51% of the nodes. Ultimately, since each block is mathematically linked to the next block, once a new block is added to the chain, it is rendered unchangeable. So if a block’s relationship with the chain is modified, it is broken. In other words, all information recorded in blocks is immutable and perpetual. Therefore, blockchain technology allows us to store information that can never be lost, modified, or deleted. Moreover, each network node uses certificates and digital signatures to verify the information and validate the transactions and data stored in the blockchain, which ensures the authenticity of this information. You could say that blockchain is like a record keeper. A means of certifying and validating any type of information. A reliable, decentralized registry, resistant to data manipulation, in which everything is recorded. We are currently used to working with centralized models. We give all our information to companies like Google or Facebook to administer, send all our messages through Telegram or WhatsApp servers so that they can send them, or spend fortunes on record keepers and institutions to certify and store our important deeds or documentation. In blockchain, data is distributed across all network nodes. With no central node, all participate equally, storing, and validating all information. It is a very powerful tool for transmitting and storing information in a reliable way; a decentralized model in which the information belongs to us, since we do not need a company to provide the service. Essentially, blockchain can be used to store any type of information that must be kept intact and remain available in a secure, decentralized and cheaper way than through intermediaries. Moreover, since the information stored is encrypted, its confidentiality can be guaranteed, as only those who have the encryption key can access it. Health records could be consolidated and stored in blockchain, for instance. This would mean that the medical history of each patient would be safe and, at the same time, available to each doctor authorized, regardless of the health center where the patient was treated. Even the pharmaceutical industry could use this technology to verify medicines and prevent counterfeiting. Blockchain would also be very useful for managing digital assets and documentation. Up to now, the problem with digital is that everything is easy to copy, but Blockchain allows you to record purchases, deeds, documents, or any other type of online asset without them being falsified. This technology could also revolutionize the Internet of Things (IoT) market where the challenge lies in the millions of devices connected to the internet that must be managed by the supplier companies. In a few years’ time, the centralized model won’t be able to support so many devices, not to mention the fact that many of these are not secure enough. With blockchain, devices can communicate through the network directly, safely, and reliably with no need for intermediaries. Blockchain allows you to verify, validate, track, and store all types of information, from digital certificates, democratic voting systems, logistics and messaging services, to intelligent contracts and, of course, money and financial transactions. This involves a consortium of large companies looking to develop blockchain-based solutions. They have several active projects. In this case, the 40 largest banks in the world have come together to develop blockchain-based solutions for their financial processes. They also produce reports and conduct research on this technology. The first blockchain-based storage initiative available to everyone. User data is encrypted and stored in blockchain to keep it secure and available. An online certification service for any type of document. It allows users to save documents in blockchain, which can never be altered or deleted. According to a survey conducted by the consultancy firm Deloitte, 74% of the companies asked consider blockchain to be an improvement for the business and plan to invest in this technology, while almost half of them already have blockchain implemented in some way in their business. Without doubt, blockchain has turned the immutable and decentralized layer the internet has always dreamed about into a reality. This technology takes reliance out of the equation and replaces it with mathematical fact. Blockchain Hardened devices: Can they restore privacy with security by design?